I’m sure you’ll agree that the best angle grinder must have enough power, reliability, and positive features to make it a tool you’ll never regret buying. These were also our top criteria for selecting the best angle grinder. If you want to cut to the chase, the Makita 4.5 inch angle grinder has the power, reliability, and positive features that make it a favorite tool for continuous-duty applications. The first thing we want to state is no matter what brand or model of angle grinder you purchase, it will wear out over time. Based on our research, we’ve found that the Makita outperforms the competition and lasts longer too. Angle grinders are efficient, powerful, and versatile tools that no handyman should be without. With a wide range of functions and accessories, you’re going to see that once you own this remarkable tool you’re not going to know how you ever lived without it. Because there are so many grinders to choose from, it can seem daunting when you’re searching for the appropriate model to suit your needs. The top-rated angle grinders mentioned here are meant to narrow down your search. One of these three is guaranteed to be a smart choice. And, if you wish to research further, the following buyer’s guide well help you to better understand this remarkable tool and all the wonderful ways it can be utilized. If you’re looking for increased output power in a more compact tool, then you’ve found the right angle grinder with this model. This tool features a Super Joint System that helps to prevent gear damage and 5 stage variable speed adjustment control dial that matches the RPM to your specific work. This tool also features an electronic limiter which stops the motor and reduces accidental motor overload and burnout. High performance and efficient, the angle grinder is backed by a 1 year warranty. This is one of the best angle grinders you can find on the market and customers universally agree that this outperforms the rest and can stand the test of time. The device measures 4-1/2 inches and is equipped with an extra-powerful motor that allows for great speed and efficiency. Easy to use and handle, this power tool can give you the results you’re looking for in half the time. You’re going to find that once you own this angle grinder you’re not going to know how you lived without it. The perfect addition to any home work shed or professional tool arsenal, this device gives you the results that you crave at a price that you can afford. 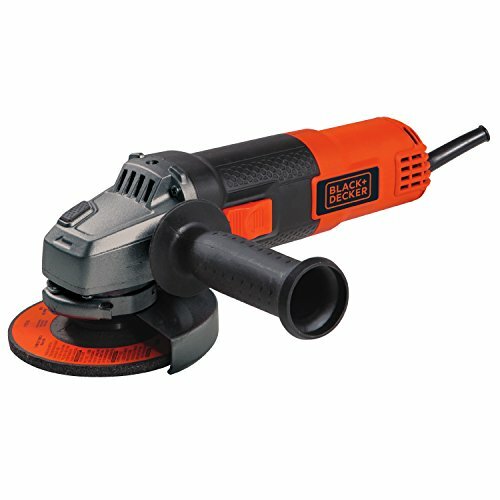 Intended to prevent dust that can enter in the air intake vents, this angle grinder helps to enhance performance with its corded, 4-1/2 inch design and quality motor that works efficiently while preventing overload. 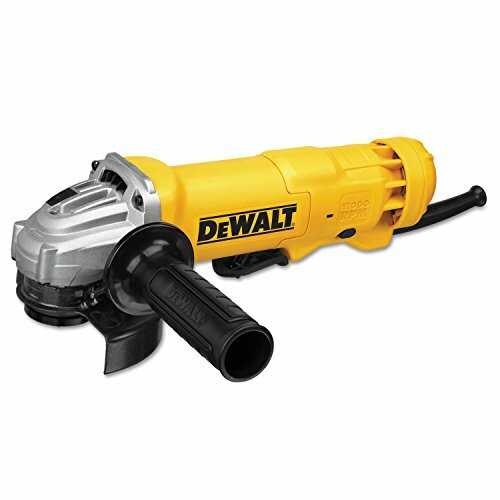 Dewalt is truly a name that you can trust when it comes to power tools. This model features a trigger grip and dual-abrasion protection which help to guard the device against debris which can damage the motor. With its powerful 13-amp motor you get a stunning 9,000 RPM of power for both cutting and grinding. Also, with the quick change wheel release you can enjoy tool-free removal. Dewalt has created one of the top-rated angle grinders on the market. The vibration-reducing side handle of this model makes operating it easier than ever…and more comfortable, too. The device is backed by a three-year limited warranty, and it comes with one year of free service. Enjoy power and performance like never before, with a design that saves you time and stress thanks to the quick-change wheel release and so much more. With the Dust Ejection System you get the ultimate in durability by ejecting dust and debris that may be damaging to the tool. All in all, it’s quite clear why this is one of the top rated angle grinders on the market. When it comes to angle grinders, Black & Decker has got you covered. This model features Overload protection and 6.0 AMPS. With a great speed of 10,000 RPM, you’re getting all the power and performance that you need to do the job right. The ample voltage of 120 AC, and epoxy motor make this tool a welcome addition to any home work station. Enjoy other features such as a burst resistant guard, exhaust system, epoxy motor protection, debris baffles, tool free guard, double insulated cord that measures 8’, and 5/8-11”spindle thread. And that’s just the beginning of what this tool has to offer. The tool itself measures 12.50”in length, and weighs a light 4.80 lbs. With the purchase of this tool, you get the 6130, type 27 grinding wheel, guard, and spanner wrench. The above, top-rated angle grinders are models that have proved time and again that they can outperform the rest at a reasonable price. These models are all ideal for the avid handyman who needs a tool that is built for professional-level performance, yet is still comfortable enough for the average handyman to operate. Perfect for all kinds of tasks around the house or in your shop, these angle grinders are versatile, easy to use, and built to last. If one of the above top rated grinders isn’t what you’re looking for, then the following buyer’s guide will give you an in-depth look at what else might suit your needs. As with anything when buying a tool, it’s best to be armed with knowledge so that you don’t make the mistake of purchasing something that does not suit your specific needs. Every handyman needs to do some cutting, grinding, and polishing on a consistent basis, and that’s where an angle grinder becomes of great use. This is a handheld tool that is sometimes referred to as a side or disc grinder, and is either powered by a petrol engine, electric motor, or compressed air mechanism. With an angle grinder, you’ll usually find a geared head, abrasive disc, adjustable guard, and side handle. The geared head is usually mounted at a right angle and holds a disc or wheel that will cut, polish, sand, or grind a wide range of materials. You’ll often find angle grinders in auto garages, construction sites, and metalworking shops. In these locations they’re used to smooth or remove excess material, and to make cuts or notches. You will find various different angle grinder discs that are suited to different materials, such as abrasive grinding discs, grinding stones, cut-off discs, sanding discs, polishing pads, and wire brush wheels. If this is a lot of information for you, and you simply don’t know where to begin, this buyer’s guide will help you to pinpoint what kind of angle grinder you need to get the job done. When you hear the name, you might think that an angle grinder only serves one purpose, but in fact it can be used for a number of tasks. Common Uses: The most common is, of course, grinding or sanding away any protruding or unwanted stone, mortar, or metal. You’ll often find construction workers use these tools when they need to make cuts or notches, or when they’re working with metal and shaping stone. Aside from these basic functions, angle grinders perform other tasks as well. Blade Sharpening: Aside from polishing and cutting, angle grinders can sharpen home and garden tools with ease. That means that you’ll be able to sharpen common tools such as hatchets, lawn mower blades, axes and even shovels. You want to make sure that blades are tightly clamped to your work table before attempting to sharpen them. It’s extremely dangerous if you don’t properly secure these items. Mortar Removal: An angle grinder is used for tuck-pointing with the use of a diamond tuckpointing wheel. You can easily clear old and loose mortar in this way without damaging the brick, and this avoids any strenuous labor usually involved when using a chisel or hammer. An angle grinder is a handheld power tool that works via an electricity-powered spinning disc. To operate the tool you must depress a switch, and when you let go of the switch, the grinder turns itself off. This is what’s known as the “dead man switch” feature and it is there to protect from injury. You grip the side handle when in use, and this stabilizes the grinder so that you can perform the task at hand. Most angle grinders are adjustable for left-handed operation as well. The tool is designed for cutting stone, metal, tile, pavers, stucco, and many other hard materials. It is able to do this with the use of a spinning wheel that has various levels of abrasion. You can find angle grinder wheels in a number of different materials; each best suited for different tasks. Aluminum Oxide: Great for woodworking, buffing and polishing, cut-off, cutting bolts, rods and bars. Diamond: Ideal for cutting concrete, stone, and tile. Fiber: Perfect for removing rust and burrs from metal. Flapper: Suited for sharpening tools, grinding, restoring edges, sanding, and surface prepping. Silicon Carbide: Meant for sharpening, rounding, and cleaning metal, as well as tuck pointing and removing mortar. Wire or Brush: Perfect for cleaning metal, removing paint and rust. There are some things you should take into account when trying to find the right angle grinder for you. There is a wide variety out there and a number of makes and models to choose from. These are available on the internet, at a home repair store and most hardware stores. You may be tempted to buy an inexpensive model, but you should only do this if you plan to use the tool infrequently or just for smaller projects. If you want the ultimate in performance, power and safety, then you should be willing to spend a bit more. Keep in mind that the greater the size of the angle grinder’s disc the more power its motor has. You’ll find a wide variety of disc sizes to choose from, and the most popular are 115 mm or 4.5 inches, and 230 mm or 9 inches. In some cases, a pneumatic grinder might be ideal with its smaller disc sizes. These tools allow for more precision on small jobs. You’ll find various different voltage, wattage, and amp ratings for each angle grinder. You generally will have your choice between 500 and 2,500 watts, and amp ratings that range from 4 to 15. These numbers will correlate with the power of the motor. A lower rating should be sufficient for most household tasks. These are incredibly powerful tools, and the unit’s disc can make anywhere from 5,000 to 10,000 revolutions per minute. Know that the higher the speed rating, the higher risk of injury if the angle grinder is not handled correctly. There are two components that directly relate to comfort of use, and these are size and weight. Unless you intend to use the tool for large construction and industrial jobs, you may want a smaller unit that is more comfortable to hold. Compact units are easier to use for long periods of time, and be sure to look for a model that features anti-vibration handles. These are incredibly versatile tools, and their discs can be interchanged. You can also install different wheels and accessories for the ultimate in versatility. Be sure to read packaging and usage guides to make sure that you’re buying the right tool for your job, as there is a wide variety of wheel and brush attachment styles available. 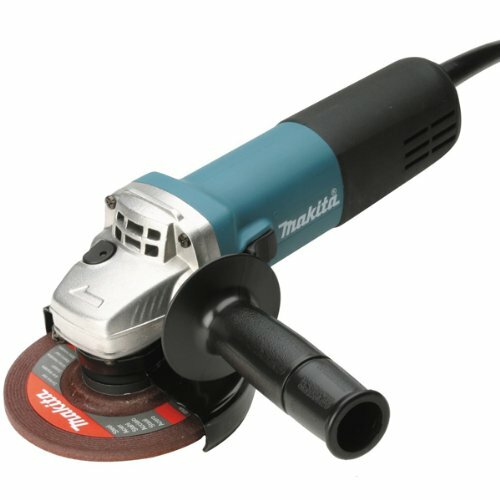 You’re going to be amazed at the versatility and efficiency of a high quality angle grinder. Owning the right angle grinder for you is all about knowing how you’re going to use it and what level of comfort you seek. No matter what kind of angle grinder you buy, be sure to splurge a bit on an angle grinder that is high-performance and built to last, as this ensures the highest level of safety. Be sure to always read packaging labels to avoid purchasing a grinding tool or accessory that is not right for you. With the above top rated angle grinders highlighted, and the knowledge you acquired in the buyer’s guide, you should be well on your way to finding the right angle grinder to suit your needs.